A bedroom should be a place of relaxation and serenity. No matter the size of your bedroom and how much stuff you own, it can still be a place of calmness. Small spaces require organization to not only house personal belongings but more importantly to keep the space clutter and stress free. This closet organization system includes drawers and double hanging space. Double your closet space by adding a second hanging rod. Move the eye level rod up a few inches, and install the bottom rod at waist height. Increase space for sweaters or handbags by installing a shelf above each hanging rod. 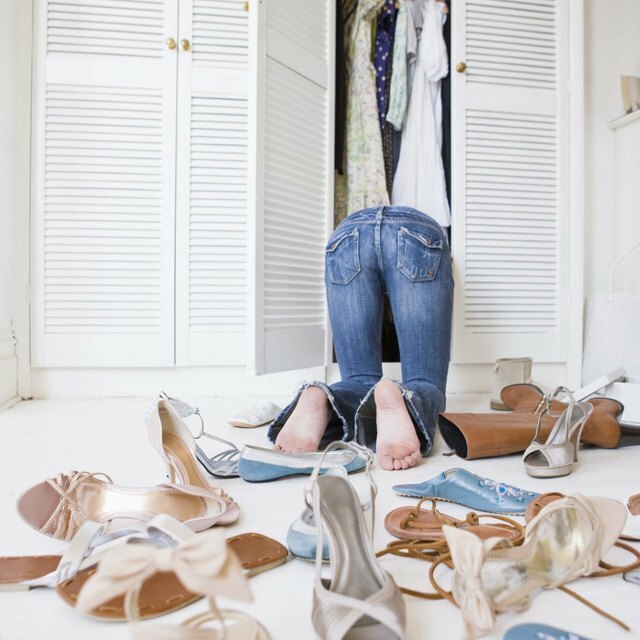 Use shoe shelves on the floor of the closet. Change out your hangers to skinny velvet ones, and use tie and belt hangers. Hang clothing from light to dark, with like items together. Store off-season clothing in an alternate location and rotate twice a year. Utilize under-bed storage. From wood to plastic to wicker, the selection of under-bed box options is vast. Use hard plastic bins or storage bags if your bedroom is carpeted. Wicker will slide better on wood floors and are decorative if you do not use a dust ruffle. If you are purchasing a new bed for your small bedroom, choose a storage bed. Storage beds maximize the area under a mattress by eliminating the need for a box spring. You can get one with drawers or open to accommodate baskets. Use bedside tables with drawers for additional storage. In a small room, each item needs to serve double duty. Expand closet space with a wardrobe cabinet with drawers. Use drawer organizers and separators to make items easy to find. Roll socks and store underwear in rows instead of piles so taking out one pair won't upset an entire pile. Install floating shelves for storing fragrances, jewelry and books. Instead of table lamps, install wall lamps to free up bedside tabletops. Hang a bulletin board to display pictures. The key to an organized small space is to keep it clean and clutter free. Hidden storage will help to keep open spaces clear, but too much furniture will also crowd the space. Use light colors to make the room feel larger. Purge the room often, and donate items that you don't wear or use. For every one new item you bring in, let another item go out.